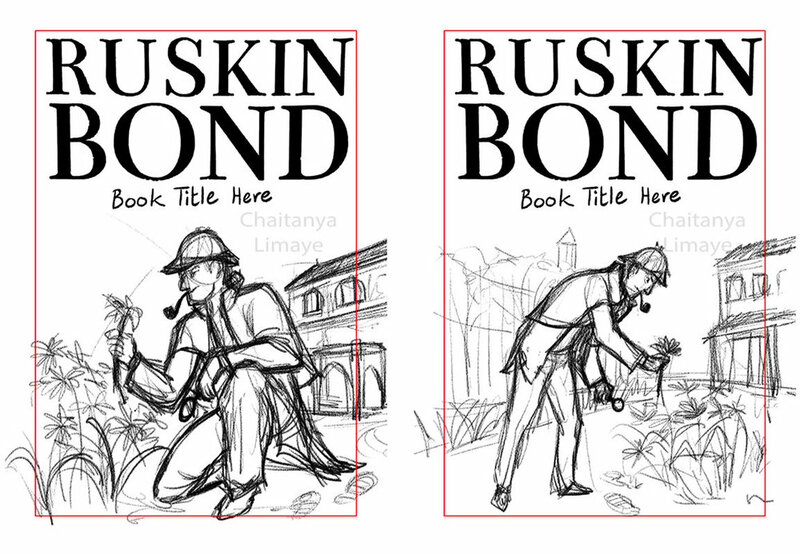 At the beginning of this year I lllustrated the covers for a few books from one of India's most beloved authors, Ruskin Bond. 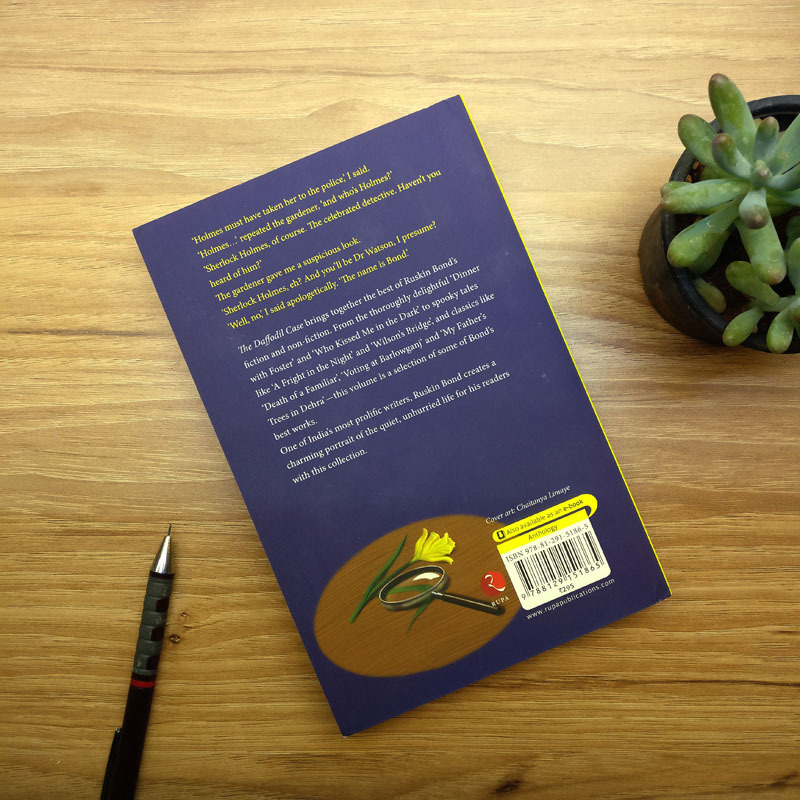 I thought of sharing my illustration process of arriving at the final artwork for the book cover of 'The Daffodil Case'. It was a treat to work on it! 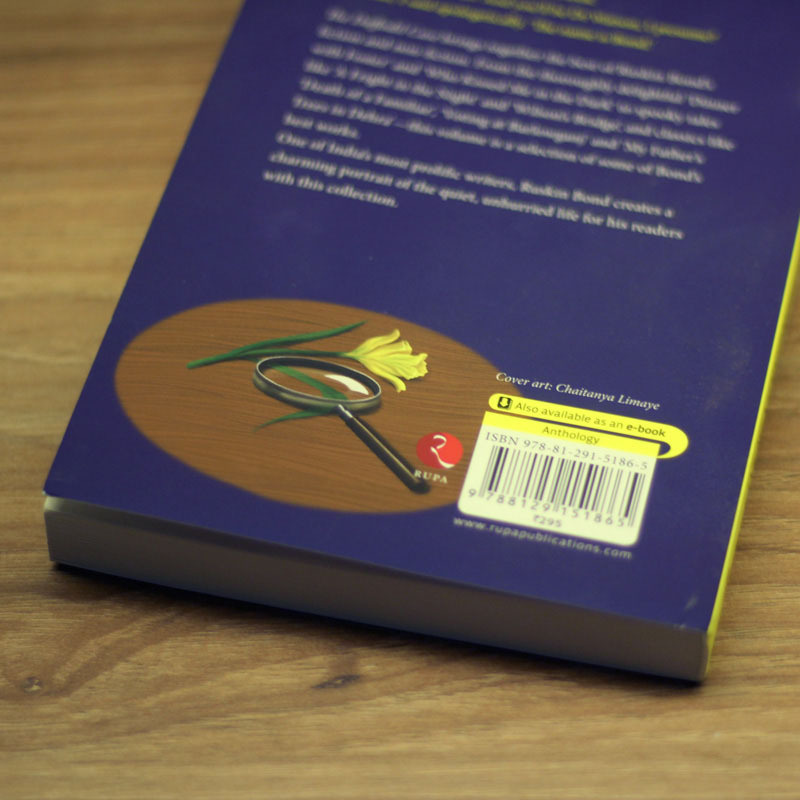 The book is published by Rupa Publications. The client gave me a brief where the character was supposed to look like Sherlock Holmes, with his typical hat, pipe and cloak—stooping over a daffodils flower bed. The scene where in the character is introduced was sent for reading. At this stage I usually do a lot of thumbnail sketches to explore possibilities in terms of composition, shapes, type of elements in order to communicate the most it can about the book with minimal elements to look at. This helps in keeping things simple. In this case though since the scene was already described, I read the pages and came up with a couple of sketches according to the description. When doing the sketches, I did research on vintage sketches of Sherlock Holmes, the popular depiction of the character and the way men in England dressed in the 1890's. Both of the sketches had a similar setting but vastly different poses that gave a different feeling to the moment with a different ratio of emphasis on the character versus the location. I sent these sketches to the client and they chose the one on the left, below. I usually draw straight from imagination or memory. But since the client required a semi-realistic style, I decided to pose and click a few reference photos of myself as Sherlock Holmes and infuse the character through the posing. This helped me make informed decisions regarding weight distribution when he's hunching over and other physicality. This is a method I use whenever I feel the need to be more informed about the subject. As an animator I have used reference for animating cartoony characters when working at Dreamworks Animation as well as realistic animals / creatures when working on VFX films like The Jungle Book. I wasn't satisfied about the pose for the hand holding the Daffodil. I shot some more reference till I was happy about something that felt believable for holding a flower with a long stem. I then reworked the sketch to get this hand pose right. After confirming the direction with the initial sketch, I made a couple of suggestions to the client regarding the lighting for the final rendering (painting). Since the cover had to look striking and dramatic, I suggested either a sunset/golden hour feel or a moonlight scene. The client went with a sunset hour lighting. Accordingly, I then did the rendering. This is the final artwork I did for the front cover. Here is a small back element I illustrated. Just like the front cover, even this went through the sketches stage like the front cover. Hope you liked the little insight into one of my methods. To see more behind-the-scenes of my work, do follow me on my Instagram - Art Of Chai .